Jelurida is excited to announce $13,000 in prizes for the winners of The Ardor Online Hackathon 2018. Developers submitted their own custom smart contracts written in Java to solve real world challenges including currency exchanges, cloud streaming, and identity management. Check out the official announcement on our website! 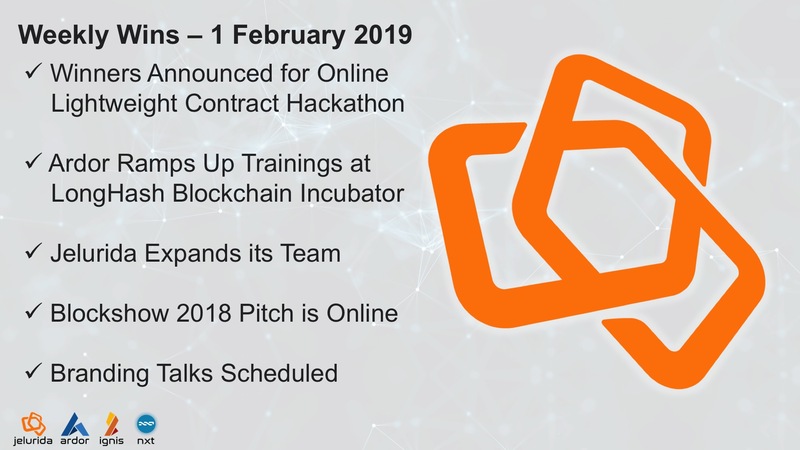 As mentioned last week, Veronica Torras is mentoring blockchain startups during the 12-week LongHash Hatch Blockchain Incubator program in Singapore. This week, she provided an extensive demonstration of the Ardor platform’s robust functionality to the blockchain startups participating in the program. Jelurida is excited to welcome Skylar Hurwitz to the team. Skylar Hurwitz, also known to the community as CryptoDemetrius, has signed an extended consulting agreement to support education and outreach initiatives around Jelurida’s blockchain platforms. Skylar has been working remotely from the USA since the start of the year. It has been a long time coming, but this week Jelurida delivered on its promise to release video from Alberto Fernandez’s pitch at Block Show Asia 2018 titled, “Overthrowing the State of Smart Contracts: Ardor’s Lightweight Contracts.” Thanks to the event organizers for doing such an excellent job with the video quality. Jelurida’s founders have scheduled meetings in the coming weeks with a new PR and marketing firm to discuss a re-launch of the branding and marketing strategies. The goal is to build a sustainable long-term operation with measurable outcomes.